Kellogg Community College’s Bruin Bookstore collected 72 pairs of shoes for donation and recycling in April. 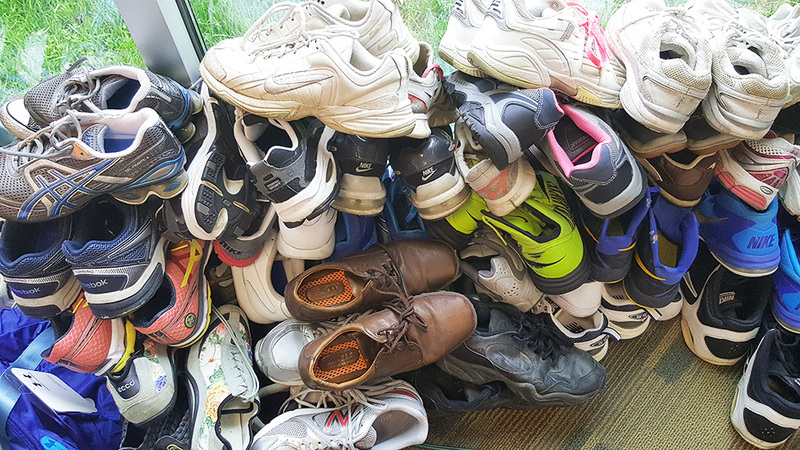 This is the third consecutive year that staff at the KCC bookstore have collected gently used or worn out shoes during an annual Sneaker Collection campaign. In 2014, the bookstore collected 110 pairs of shoes; in 2015, the bookstore collected 70 pairs. “We would like to thank everyone that dropped off sneakers at the KCC Bruin Bookstore to help make our April recycle drive such a success,” said Catherine James, manager of the bookstore. This year, 33 pairs of gently worn shoes were donated to the Charitable Union for reuse. The additional 39 pairs of shoes were donated to the Borgess Run Green Strides program for recycling. The Sneaker Collection is one of many community collections undertaken at the Bruin Bookstore each year, which include an annual Hoodies for the Homeless shirts and coats collection each fall semester. An eyeglasses collection in March at the bookstore resulted in nearly 250 pairs of used eyeglasses collected for donation and recycling through the Lions Club Recycle for Sight program. For more information about the KCC Bruin Bookstore’s Sneaker Collection campaign or other KCC bookstore initiatives, contact the bookstore at 269-965-4128. General information about the Bruin Bookstore, including key textbook dates for students, is available online at http://bookstore.kellogg.edu/store1/home.aspx. Pictured above are shoes donated to the Bruin Bookstore’s Sneaker Collection campaign, shot by bookstore clerk Kari Barton.